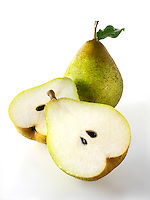 Fresh pears food pictures, photos & images. 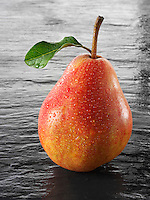 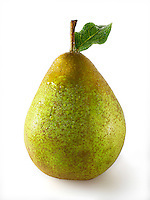 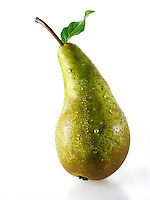 The pear is a fruit tree of genus Pyrus and also the name of the tree's edible pomaceous fruit. 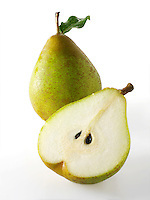 The pear is classified in subtribe Pyrinae within tribe Pyreae and is a perennial. The cultivation of the pear in cool temperate climates extends to the remotest antiquity, and there is evidence of its use as a food since prehistoric times. 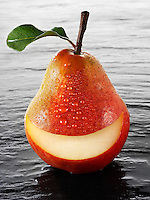 Many traces of it have been found in the Swiss lake-dwellings. 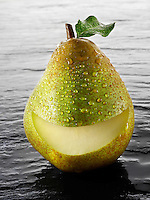 The word "pear", or its equivalent, occurs in all the Celtic languages, while in Slavonic and other dialects different appellations, but still referring to the same thing, are found—a diversity and multiplicity of nomenclature which led Alphonse de Candolle to infer a very ancient cultivation of the tree from the shores of the Caspian to those of the Atlantic. 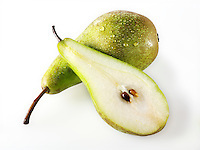 The pear was cultivated also by the Romans, who did not eat them raw: Pliny's Natural History recommended stewing them with honey and noted three dozen varieties. 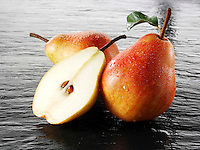 The Roman cookbook attributed to Apicius, De re coquinaria, has a recipe for a spiced stewed-pear patina, or soufflé (IV.2.35). 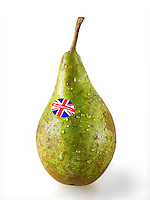 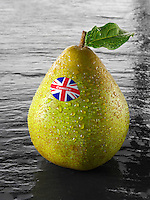 A certain race of pears, with white down on the under surface of their leaves, is supposed to have originated from P. nivalis, and their fruit is chiefly used in France in the manufacture of perry (see also cider). 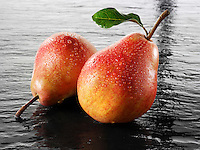 Other small-fruited pears, distinguished by their early ripening and apple-like fruit, may be referred to P. cordata, a species found wild in western France, and in Devonshire and Cornwall. 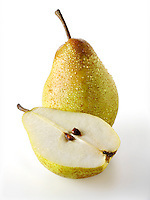 Pears have been cultivated in China for approximately 3000 years. 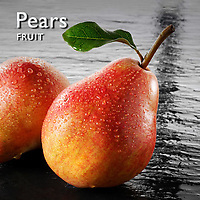 The genus is thought to have originated in present-day western China in the foothills of the Tian Shan, a mountain range of Central Asia, and to have spread to the north and south along mountain chains, evolving into a diverse group of over 20 widely recognized primary species. The enormous number of varieties of the cultivated European pear (Pyrus communis subsp. 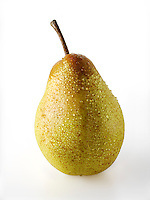 communis), are without doubt derived from one or two wild subspecies (P. communis subsp. 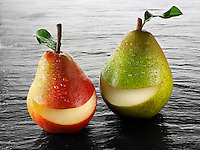 pyraster and P. communis subsp. 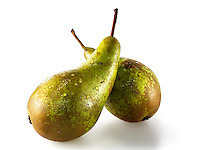 caucasica), widely distributed throughout Europe, and sometimes forming part of the natural vegetation of the forests. In England, where an ancient pear tree gave its name to Pirio (Perry Barr, a district of Birmingham) in Domesday, the pear is sometimes considered wild; there is always the doubt that it may not really be so, but the produce of some seed of a cultivated tree deposited by birds or otherwise, which has germinated as a wild-form spine-bearing tree. 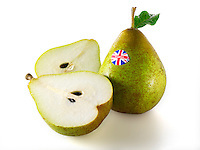 Court accounts of Henry III of England record pears shipped from Rochelle and presented to the King by the Sheriffs of London. The French names of pears grown in English medieval gardens suggests that their reputation, at the least, was French; a favored variety in the accounts was named for Saint Rule or Regul', bishop of Senlis.